Photo #2 - The Main Rock Tower And Some Fish. 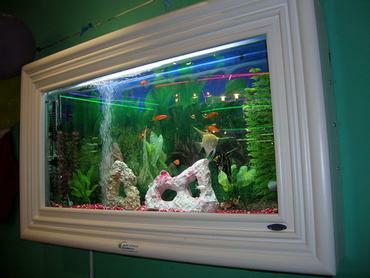 fish tank picture - Another angle of the "deep end." 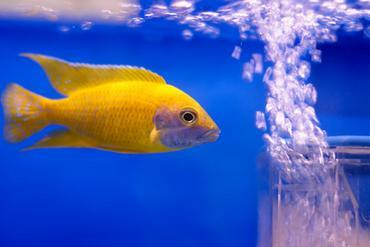 fish tank picture - Close up of some of our Cichlids. 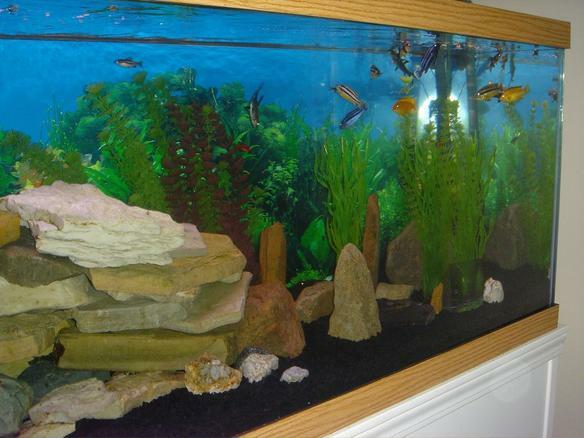 75 gallons freshwater fish tank (mostly fish and non-living decorations) - Freshwater 75 gallon mostly Cichlid tank. Newest photos now that our tank has cycled and we have much cooler fish! Photo Caption: The main rock tower and some fish. 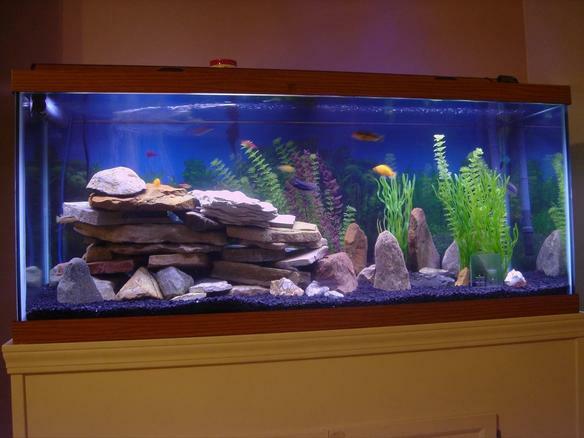 Description: This is our very first tank. I had a 10 gallon in college many years ago but now my 4 kids and I decided to dive in deep. 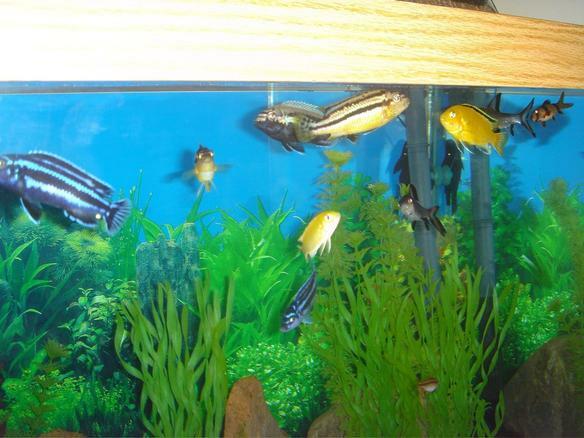 We hope to graduate to salt someday but for now we have 3 Cherry Tetras, several Cichlids (electric yellow, blues, yellow and black stripe) 3 clown loaches, 2 bala sharks and 3 bristlenose. We had a couple of others as we developed our tank but they have been eaten during the territorial establishment process. They seem to all be doing well now. 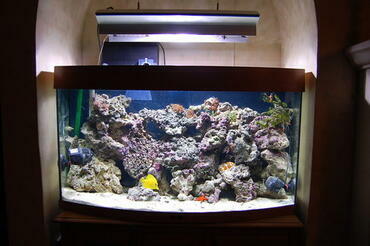 As for the tank setup. The lighting is just your basic fluorescent during the day and a 16" moonlight for the night. All of the big rocks were gathered from our old farm in Indiana and the bottom is Tahitian black sand mixed with black rock. Plants are plastic and the filter is an Eheim 2028 Pro II. I got this brand new for half price. We also have a submersible heater and the biggest Whisper air pump. One VERY unique feature in our tank is the solid crystal house that is in the plants near the right side of the tank. It was given to us as a wedding gift 15+ years ago and since we are not much for nicky nacks, we decided it would look awesome in our tank. IT DOES!! Advice: I am brand new but have actually spent the past year studying. The thing I keep hearing from every aquarist I talk to is start easy and don't overfeed. Now that we are several months into it, the next piece of advice I kind of learned the hard way is to take your time cycling your tank. Find a good, local fish store (not Petco or Walmart) and do exactly what they say to cycle your tank. Also, buy cheap fish like we did to start so when (not if) a couple die, it won't hurt much.